← Is purposeful geoengineering causing the ‘rapid intensification’ of the 2017 hurricanes? With the meteorological onslaught of Hurricanes Harvey, Irma and Maria, it’s now clear that North America is under a full-blown invasion by the NWO ruling cabal and their geoengineers. MARIA’s rampage through the Caribbean has already produced damage that is being described as unprecedented and “beyond catastrophic”. Puerto Rico may not have power for 6 months in the aftermath. So, there are two questions that everyone ought to be asking themselves: Why have there been so many unusually powerful hurricanes this year? And what is causing these frankenstorms to intensify into mega-hurricanes so quickly? It’s important to point out that the last major hurricane to hit the continental US, prior to the 2017 hurricane season, occurred in October of 2005. This was followed by a baffling 12 year hiatus. Then, mysteriously, with the election of Donald Trump, the Atlantic Ocean turns into a veritable conveyor belt slinging one hurricane after another at the North American continent. How is it that, since 2005, the U.S. mainland has not been hit by a major hurricane… … … and then Donald Trump is elected POTUS and all hell breaks loose?! There is no greater act of defiance against the New World Order agenda than President Trump’s decision to pull out of the Paris Climate Accord. 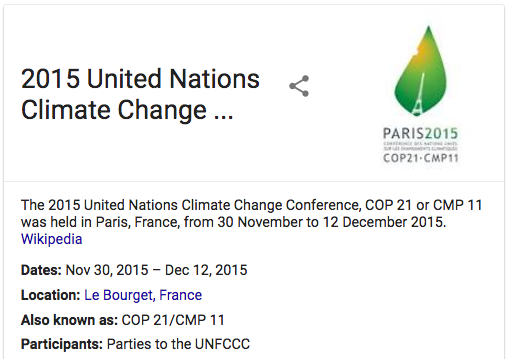 Perhaps Trump really did not know how essential the Paris Climate Agreement was to the implementation of the NWO agenda toward the establishment of a One World Government. Unfortunately, what is really going on is far too big for most people to grasp. President Donald Trump, every U.S. citizen and the American Republic are under direct assault from the geoengineers who have been conscripted by the globalists to wage full-scale weather warfare. Not only are these geoengineers paid quite well, they are furnished with state of the art weather manipulation technology that makes frankenstorm creation look like a walk in a gentle summer shower. The critical point is that TPTB have demonstrated a zero-tolerance level of obstructionism from the Trump administration. Because the U.S. Federal Government plays such a pivotal role in the execution of the NWO agenda, it must be kept on the reservation at all cost. For without the threat of U.S. military action, as well as government and Wall Street enforcement via economic sanctions, financial terrorism and/or corporate sabotage, the Zio-Anglo-American Axis* is basically a paper tiger. Consequently, the cabal feels compelled to use any means necessary, and every way possible, to corral Team Trump into the pen of climate control compliance. Welcome to the 2017 hurricane season! This stealthy strategy also means that the USA will continue to experience various types of environmental terrorism in addition to the all-out weather war. The record wildfires in LA were a good example of this. So are the ongoing wildfires in several western states. Countless residents in Montana still cannot leave their homes because of the unrelenting smoke and airborne ash. The bottom line is that the formation of a One World Government is wholly dependent upon the emerging Carbon Control Matrix. The false CO2-driven climate change agreement ultimately demands the complete command and control over all carbon dioxide production worldwide. Hence, a “Global CO2 Management Regime” will provide the basic framework of those budding institutions that will initially comprise the One World Government. The NWO globalists and their geoengineer henchmen are on a very serious mission indeed. 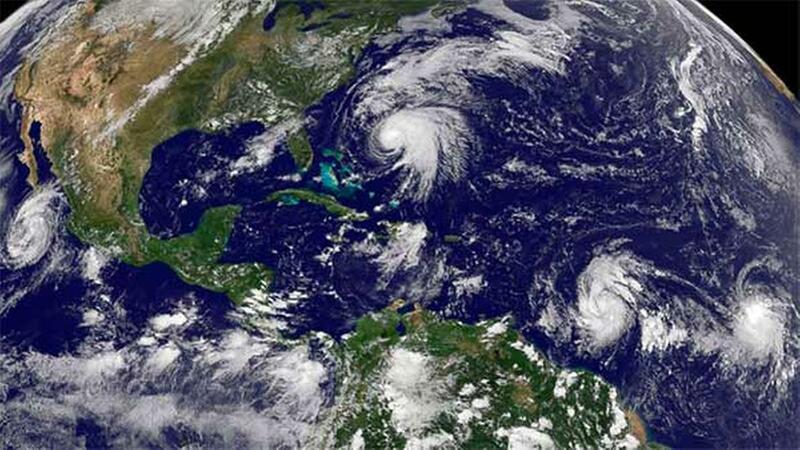 In just a span of one month North America has seen the formation of major Hurricanes Harvey, Irma, Jose and Maria. But there were others that never made landfall. What follows is a comprehensive list of just the Atlantic hurricanes brought to US by the geoengineers and their globalist sponsors. The globalists don’t care if they have to devastate whole islands or destroy major cities to impose their will on the planetary civilization. From this point forward, concerning these NWO crazymakers, it’s going to be either their way or the highway to hell. The unfortunate victims scattered throughout the Caribbean are now witnesses — twice thanks to IRMA and MARIA — to such transparently engineered hurricane havoc. 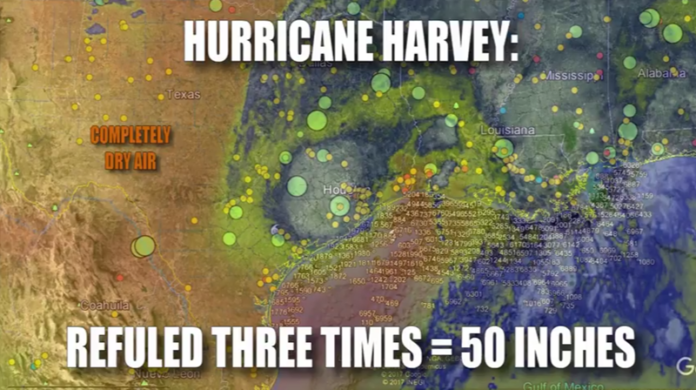 The following series of articles on Hurricane Harvey reflects the various reasons for launching that superstorm at the Texas coastline. There’s never just one or two objectives that the globalists have in mind as each post below explains. Weather warfare and environmental terrorism are now undeniable manmade phenomena. Those who perpetrate such heinous war crimes and mass murder must be held accountable post haste. However, as long as the political class and scientific establishment are systematically ponerized, these recurring cycles of mass destruction and death will never end. Which brings US to the only practical remedy left to We the People. With so many folks waking up to the fact that the weather has been methodically weaponized — against all of US — a critical mass of truth seekers must unify and act to stop this madness. Exactly what forceful action can be taken for maximum effect is yet to be determined. Nevertheless, there is a durable solution to this intensifying weather war predicament that is in the offing. In the meantime, nothing but sincere and continuous prayer can create the reversal that is desperately needed by all of humanity. For it seems that only the Highest Power can successfully intervene on behalf of We the People at this critical flashpoint of human history.